It has been promised for years, but today actually having a wallet in one’s phone is now a real option. The media’s love affair with all things Apple has made Apple Pay very visible in the headlines. Outside of the orchard, there are phones that, for years, have had the proper hardware, NFC (Near Field Communications) to get job done. How does all of this work in the real world? Does it work at all? Is this all worth it? I will attempt to answer those questions, with first hand experience. I setup my Windows Phone powered Lumia 1020 and…well…no spoilers. Read on to see how it all turned out. Whether you are a fan of iPhone, Android or Windows Phone, you can participate in the growing practice of using your phone to tap and pay for things. If you are in the Apple crowd, all you have to do is buy a new iPhone 6/6+ and you have the necessary hardware for Apple Pay. If you have an older iPhone, you are out of luck. If you have a higher end Android, you have an NFC chip. Most of the Windows Phones are also NFC equipped. In either case, almost have your hardware ready for action. Beyond that you need an app. We’ll get into all of that in more detail, but fear not, it is fairly simple to get set up. Like I said, the newest iPhone is hardware-ready for tap-to-pay, out of the box. Android has a couple of options. Using Google Wallet, you now need to have a phone with HCE (host card emulation). Both Windows Phone and Android can also use Softcard, a company co-owned by Verizon, AT&T and T-Mobile. To use that system you need a Secure Element SIM which you can get from one of those carriers for free. Since I have a Windows Phone, I will be using the Softcard system. There are some advantages to this system, but to get started you have to get a new SIM card. 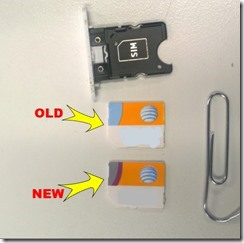 As you can see from the picture, the SIM cards are pretty identical. You can tell them apart basically from the label coloring in the upper left hand corner. To get the new SIM, you just go into your carrier store and ask for one. It’s FREE and pretty quick. They do verify your account and activate it, since the SIM also runs your phone. Now you’ve got a brand new SIM and you are hardware ready f or action. Now you need the software. When you install Softcard, it will guide you through the setup. You can enter in some cards, if you use a bank that supports the system. If your bank does not directly support Softcard, have no worries. You will have an option to sign up for an American Express SERVE card. The Amex SERVE is not a credit card. It is essentially a pre-paid debit card with some cool features that I’ll write about below. Sign up for the SERVE from within the app (this avoids ALL fees). You’ll also setup a PIN number that will have to be used for transactions. Once you have your Softcard setup, you are ready to hit up some transactions. Before we get started, let’s make sure you understand why you signed up for the Amex SERVE card. If you don’t have a credit/debit card with Wells Fargo, Chase or American Express, you need to get the Amex SERVE. Yes, it is a prepaid card that you can refill, but you don’t have to use it that. You can set up your bank card…any card…to be the unlimited backup to your SERVE card. That means, you never have to fill the SERVE card as it will just be a conduit of payment. It will be accepted for tapping and it the transaction will be funded from your choice of cards. Nice loophole around not having all the banks signe d up yet. You will also get a physical card, but you can start using it for tap within a few minutes of signing up. Also, by signing up for SERVE within the app, you don’t pay any monthly fees. The Amex fees are small anyway, but now you don’t ever have to worry about them. SERVE also solved my cash problem. I bank with USAA and Navy Federal, neither of which have branches in Los Angeles. Since I do freelance work, I can get paid in a variety of ways. If someone pays me by check I can just remotely deposit using my phone or scanner. If they pay me cash, I’ve always wp_ss_20141110_0003had a problem getting that cash into the bank. With SERVE you can deposit $20-$500 cash onto the card at locations like CVS and 7-11 with no fees. If you connect your bank, you can transfer the money to yourself or you can use their online bill pay to just use the cash that way. You can also decide later to get that cash back out by using the ATM fee free at over 24,000 MoneyPass locations. SERVE and Softcard together have some great rewards and incentives for using tap-to-pay. They have special deals with stores and they also have time limited deals for cash back. Right now, I’m getting $1 for each qualified transaction. Qualified = $1 or more. You can do this and get back up to $50 per month. They don’t wait until the end of the month, either. You get your cash back pretty quickly. You could, in essence eat from the $1 Menu at McDonald’s, 50 times for free! This deal is over on December 31st, but I’m sure they will ring in the New Year with more deals. Unlike Apple Pay, Softcard is designed to make the payment, apply offers and add to your loyalty card…all in one tap. In my immediate walking distance, I can use tap-to-pay at: Jamba Juice, Subway, AT&T, McDonald’s, Office Depot (not quite walking), Chevron, John Peete’s Fine Wine and Liquor, American Apparel, Radio Shack. The CVS and 7-11 won’t let me pay, but I can deposit cash at those places. There are more store locations near me that I could go tap-to-pay, but they aren’t places that I would normally go. So, tapping to pay isn’t everywhere yet, but it is growing. There is a push for merchants to finally start making themselves ready for contactless payments. Besides the phone, chip and pin credit cards are making their way to the US market. If you accept card payments, you might want to ask your processing company about upgrading your point of sale. If you are a consumer concerned with increased security, you might start talking to the merchants you do business with and suggest that they upgrade, so that you can enjoy contactless payments in more locations. In the long-term, it really is great for merchants. They will see fraud numbers decrease which could bring their rates down. The transactions will be faster and more secure for their customers. My first tap-to-pay transaction was at Subway on Santa Monica in West Hollywood. I had to ask asNFC Payment Logo there were no stickers in the window and the machine wasn’t in plain sight. For your reference, you’ll likely see a sticker like the one on the right on terminals that will acc ept tap-to-pay. After inquiring and finding out that they do, in fact, take contactless payment. The cashier only knew it as Apply Pay, so I had to let her know that it would work with my non-Apple device using a non-Apple Pay app. She hit the right button on her register and it was easy as could be. NOTE: The $1.00 cash back was added to my account within a day of the transaction. Nice. So that was it. There were no trumpet sounds or fireworks, just a quick and easy transaction. I think if the merchants can withstand the costly upgrade that we might be on our way to a new mainstream way of paying for things. 5 Responses to "Tap That – My Tap To Pay Experience"
Thanks for your guest blogger hospitality! 🙂 Since I wrote this, I’ve used Tap To Pay at Walgreens and I even went to AT&T to pay my bill with it. I’m hoping to see more merchants upgrading their POS systems to take advantage of contactless payments over the next year. I know the fine people at eCMS can help them do that!